Carlo Ferrari was born in Castelnuovo Garfagnana (Lucca) and then moved to Massa where he has lived and worked for almost forty years. Self-taught, his intense passion for the arts began at an early age. He soon became acquainted with important figures of the Italian culture of that time, including author and literary critic Renato Majolo who appreciated and encouraged his first poetic experience, and with various artists (the painters Virio Da Savona, Aurelio Caminati, Gianni Celano, the sculptor from Pistoia, Agenore Fabbri, the writer Milena Milani, who he met at the Artists Circle exhibition in Albisola Marina in 1972) but especially with the painter Dedalo Montali, who was greatly impressed by his works, at the A77 Gallery shown in Albisola in 1973. He was both a sincere friend to Ferrari and an important reference for his artistic and cultural training. At the same time on his own he began studying music and playing the organ, having also significant experience as a choir director. 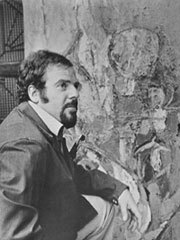 In the years that followed, he developed an intense activity holding numerous solo exhibitions (Genoa, Millesimo, Chieri, Castelnuovo di Garfagnana, Viareggio, Carrara, etc..) and participating in various collective exhibitions, such as the Contemporary Painters Exhibition in Lucca, where he received unanimous approvals for a painting of substance, without cunning, frills and stroke effects, based on an innate and solid ability which enabled the expression of colour. In 1985 he held a solo exhibition in a summer collective art show at the ex Montedison Palace in Lido di Camaiore. During the same period (1970s – 1980s) he successfully participated in numerous art competitions, obtaining awards and quotations from everywhere: Premio Garfagnana and Premio Vecchiacchi in Castelnuovo Garfagnana, Premio GB Santini in Castiglione Garfagnana, Premio di pittura estemporanea in Massa and Cozzile, Premio Versilia ’73 in Viareggio, Premio Internazionale Michelangelo d’Oro in Carrara, 1st Prize at the Concorso Nazionale del Quadro di Piccolo Formato in Viareggio, Giano d’Oro in Varese, Nettuno d’Oro in Forte dei Marmi, etc..
His commitment as President of the Massa Musical Association dates back to those years and also his friendship with the musicologist Robert Giannone who died prematurely and stimulated his study of the late-romantic and 20th century history of music (and in particular the composers Mahler, Ives, Ravel and Bartòk, which organised guided listening concerts for piano and orchestra). In the subsequent period, from the late 1980s to 2010, while continuing to develop his own pictorial language and dedicating himself to poetry, he had voluntarily ceased to exhibit. His return to the public took place with a personal show at the beginning of 2011 (Carlo Ferrari: the Colour, the Word) in the halls of the prestigious Palazzo Panichi - Carli in Pietrasanta, with the exhibition of approximately sixty works, both recent and older, and a series of poems. The catalogue "CARLO FERRARI - Creations on reality" was published by Petrartedizioni of Pietrasanta on the occasion of the exhibition at the Marino Marini Museum in Pistoia.